Thanks everyone for the input and information. Eugene, I will definitely chk for bubbles, but what does that really tell me except confirming I need a new gasket? Don, I may order a set when I get the gasket, just to be on the safe side. As far as a compression chk, I already know that #3 is probably in need of new rings because the plug fouls more than the rest, and yes it burns a little oil as well. That is a little deeper than I want to dig at this point. As I said previously, for 70 yrs old it runs like a champ, it starts with just a touch of the starter rod (or crank if the battery is dead), and I'm afraid if I do one thing, that will lead to something else and I'll end up with falling dominoes. I can't have it out of service that long. I'll get the gasket and bolts ordered, then up date progress. Once again my thanks to all. The bubbles in the coolant would be exhaust gasses going through the broken head gasket into the coolant passages and working their way to the radiator. Ok everyone here is another question. Should I flush the cooling system before or after I change the head gasket? 65 Lo-boy 19648 with an un-stuck #4 - it lives!!! My bad! - it did!! Sorry! Ok guys, I got my head gasket and bolts today, plan on tearing into it this weekend. I did a radiator flush last weekend when I was mowing, and also checked when it was at running temp and no bubbles were visible in the radiator. So I guess the oil isn't coming from the combustion side. I guess I won't really know until I get the head pulled and get a good look. Could oil be getting into the bolster somehow? I checked the steering reservoir and that oil is clean and full. So no leakage between there and the radiator base. One final question (for now) I have an old shop guild that says head bolts should be tightened to 45 ft/lbs. I have seen other threads where it has been mentioned that different bolts have different torque specs. Hopefully Glen can furnish the right page or thread with the needed info and save me time searching on my own. Thanks everyone for your input and feedback up to this point, keep fingers crossed I'm going in. Torque spec in the manual say 45. Go in steps as you do it too. I torqued all mine to 25 then went up to 35 and finally stepped up to 45. Before you put the head on, I would check the block surface, and the head surface with a straight edge, to be sure they are flat. I would check all the head bolt holes. Run a tap in them and be sure they are clean. Then run a die on all the head bolts, if you are reusing them. Then turn the bolts into the holes by hand, and see if they all screw in easily. They have to turn easily to get an accurate torquing. I would turn new bolts in the holes too, the threads can have defects. Turn a die on the bolts if needed, to improve the threads. The head bolt threads need sealer, they go into the water jacket. I use Permatex Aviation Form A Gasket, it is a liquid, non hardening sealer. It comes in a little can with an applicator brush made in the lid. If you buy one, stir it up well with a screwdriver or something, it settles in the bottom of the can some, sitting around. They have it at NAPA here in the west USA. Some of the guys on here would probably say since you have a problem with the head sealing, to use the Copper Coat spray sealer on the new head gasket, both sides, before putting it together. Below is a pic of it. They might have it at NAPA also. Clean everything well, the flat surfaces, and all the carbon from the piston tops, and valves. When done cleaning, use paint thinner on a clean rag, and remove all oil from the flat surfaces of the block and head, so the Copper Coat will seal. Let the surfaces dry before putting the head on, use air if needed, wear your safety goggles when using the air. 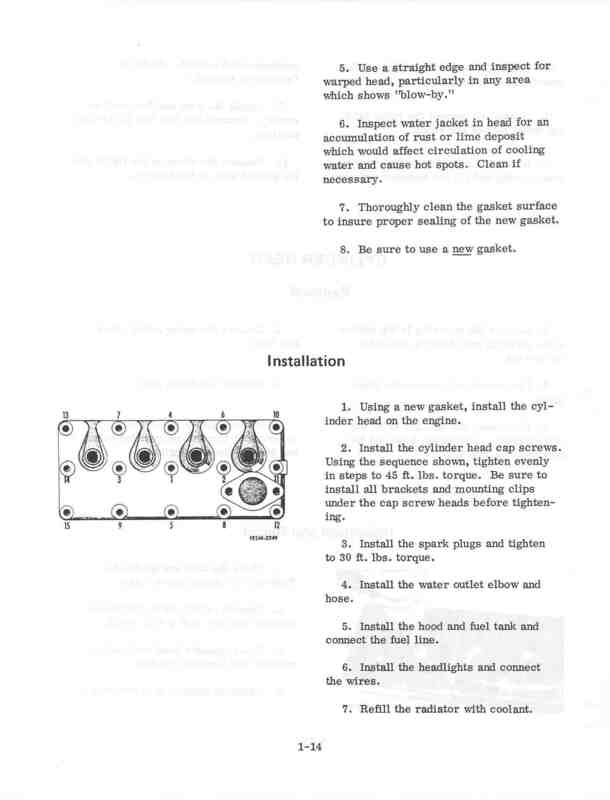 Below is a page from the Cub service manual, GSS-1411, showing the head torque sequence, and torque. They have the manual at the top left of the page, at Quick links. You will probably need a new gasket for the water elbow on the head, and maybe a new hose there too. Below are listings at TM Tractor for them, or you can make a new gasket from gasket material. It gives the sizes of the hose in the listing, they can probably cut a piece the right length at NAPA. If the clamps are old and don't turn easily, new ones are good to put on. Thanks LR, kinda like tightening lug bolts in the old days. Thanks Glen, new I could count on you for the right info. Every time I try to get the links, my tablet shows it downloaded but then I can find it. Tablet is smarter than me lol. Thanks Unfriend, I've been seeing a lot of posting about seafoam, but have never used it. I've thought about adding it to my oil and gas, just don't know that much about it. I'll post some pics when I get it opened up. For education purposes to new folks if nothing else. I think this project may be like remodel work, you never know what you'll find until you tear into it. Well if it weren't for bad luck, I'd have none. Twisted the head off bolt #1. The one that's dead center in the head. The rest came out fairly easy. I've gotten the he freed up but the shaft of that bolt is frozen in the head. I can twist/rock the head about an 1/8" at the corners. I believe the threads are free, it's the shaft that's bound tight. I drilled out about 1 1/4" (that's as far as my smallest bit would reach) applied heat and liquid wrench. Still frozen. I filled the hole with liquid wrench, hoping it will swap down over night and break free tomorrow. Patience is your friend. Let the penetrant work. Not my strong suit but I'll try. That's why I had to walk away from it today. Too frustrated and panicked. I am glad I took everyone's advice and got new head bolts though. Now I'll need them.